In September of 1718 John Richards, a schoolteacher from Whippanong, New Jersey, deeded three and a half acres bordering the Whippanong River to the town for a church, a school, a militia training ground, and a burying yard. Three months later, Richards had the distinction of being the first person laid to rest in the ground he donated, according to local lore. The picturesque Whippany Burying Yard today contains almost 400 brownstone, marble, and granite markers spanning three centuries, and its age shows. But that’s not always a bad thing. Markers at Whippany range from simple headstones to ornate obelisks and box tombs. Unfortunately, though, centuries of environmental damage and the burying yard’s proximity to busy Route 10 have deteriorated its historic markers. Many had become so fragile that they delaminated, cracked, or toppled over. The inscriptions on some were all but illegible from weathering, while stubborn bio-growth such as moss and lichen obscured inscriptions and carvings on others. Additionally, the Whippany River altered course over the years, now flowing closer to the cemetery and increasing the threat of erosion. The Hanover Township Landmark Commission, which maintains the site, initiated small conservation campaigns over the years when funding was available. But with the impending arrival of Whippany Burying Yard’s 300th anniversary this year, the commission is focused on conserving as many markers as possible before the milestone. “I didn’t realize that this was going to be [so] important to me,” says Mike Czuchnicki, chairman of the commission since 2012. But under his stewardship, the group secured funding for the burying yard’s preservation. The Township Committee granted $50,000 after the commission identified 49 stones in 2016 that needed immediate repair. In 2017, an additional $10,000 from the township and $39,859 from Morris County went toward JBC’s conservation of 16 vertical markers and one box tomb. Hoagland and her team first removed bio-growth on the brownstone and marble markers with a stiff, natural-bristle brush, water, and D/2 Biological Solution. “Our goal wasn’t to make them look pristine, but we did want to remove any biological growth that could be doing damage to the stone,” she explains. 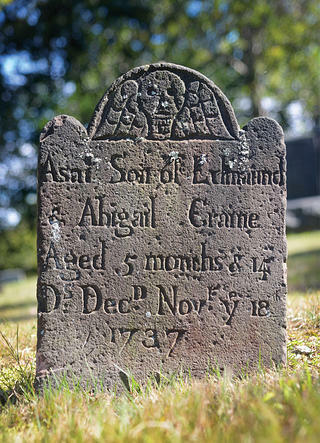 The 18th-century winged death's head motif affirmed life's impermanence. The team patched markers that had minor deterioration, and inserted metal pins into those that had broken apart. One marker, however, was too fragile to be pinned, so the crew designed a custom armature to keep it secure. 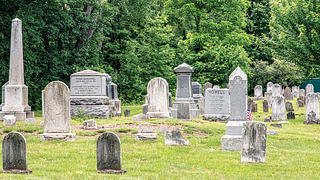 JBC will conserve 13 more tombstones in time for Whippany Burying Yard’s tricentennial celebration in September. By that time, Czuchnicki hopes to have installed a hedge separating Route 10 from the burying yard to mitigate further erosion and pollution. Restoring a cemetery brings a whole new list of tasks to a preservationist’s checklist, but perhaps the most noticeable part of the project is the re-setting of headstones. Whether your cemetery restoration project is large or small, these eight tips will help you re-set headstones properly. Here you have the luxury of letting your pooch off the leash without ever worrying about traffic or police or indignant neighbors. Dog owners, as a consequence, have become a force in the cemetery’s preservation associations, assisting in restoration work and, equally important, ponying up money to keep the grounds thriving.